Hub On Wheels, Boston's only citywide bike ride, provides cyclists with some of the most unique perspectives of the city's neighborhoods. It's your chance to ride along the Charles River with no cars getting in your way; explore the greenways and the shoreline, and the neighborhoods and the communities in Boston. The event begins at City Hall Plaza 8:00 am. There will be free snacks and a music festival on the plaza from 9:00 am to 2:00 pm. Cyclists can ride through Boston on a Sunday morning via fully-supported 12 or 45-mile routes that loop back to City Hall. The 12-mile Downtown Route is extremely popular, as the streets are shut down to automobile traffic for the event. The Emerald Necklace Route is 45 miles in length and winds along Storrow Drive and the park system to Arnold Arboretum and back. 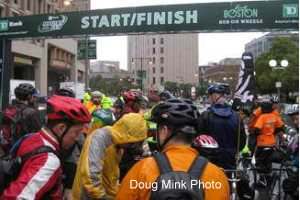 Each year the ride brings together participants, hundreds of volunteers, and numerous local businesses in celebration of Boston and bicycling. With routes looping through downtown, the Back Bay, Jamaica Plain, Roslindale, Hyde Park, Mattapan, Dorchester, and South Boston. The ride presents a truly unique way to see the city. Please note that cyclists must be 10+ years of age to ride the 12-mile route, and 12+ years to ride the longer routes. Children of any age are allowed as tandem riders with an adult. An end-time limit of 2:00 pm is set, with riders who fall behind being re-directed onto a shorter route at rest stops. Hub On Wheels was founded in 2005 with three goals: create an important civic event, showcase Boston's neighborhoods and parks, and raise money for important causes. The event draws crowds from the entire New England area as well as Canada, and in previous year's, attendance has exceeded 15,000 riders and spectators combined. Produced by the EF Education First., the Hub on Wheels citywide fun ride event promotes former Mayor Menino's idea of safe cycling and healthy living, and today benefiting Boston Children's Hospital.